life's a beach WALK: Ready, Steady, GO! Life's a Beach Walk will officially start from Byron Lighthouse on Sunday the 4th of March at midday. If you are in the neighbourhood come on up to wave me goodbye! Parking might be a bit of a bother, unless you park at the bottom of the hill and walk up, then you can do the first couple of kilometres with me on the way back down. 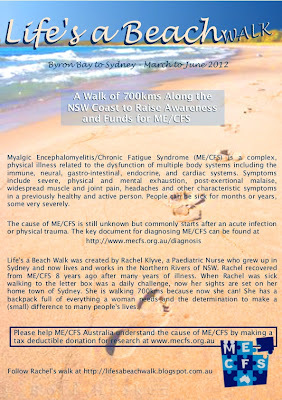 Life's a Beach Walk is now on several ME/CFS Society websites. Thanks to Penny at ME/CFS Australia. Check out the Links page for details. Also the first donations have been given, thanks to Jo at Lismore Base Kids Ward for her generosity and to all the Kids Ward staff for their enthusiasm! Sorry I can't see you off but I hope to be there at the finish line to see you home. You've had one massive journey through years of CFS and now another journey, this time of your own choosing. It's fantastic you're well enough to do this & you are an inspiration! All the best & know I'm walking with you in spirit. Lisa.